I am back here after a long time. More than two years, in fact. And the card to restart this journey couldn't have been more appropriate. Yet another pointer towards how apt the 'Card of the day' is when you really connect with it. The card that lies in front of my eyes is the Prince of Wands from Thoth Deck. Equivalent to the Knight of Wands in other conventional decks. Even before you get into the details, the raging fire and energy of the Knight come to you as a knock-out punch. If you are not careful to step side, he might well nigh crush you under the wheels of his speeding chariot. But currently I am not a bystander watching this Knight go past me. I AM the Knight. His chariot is drawn not by a horse as usual, but by a lion. Himself a symbol of sheer force and vitality. It is important to note that all the Princes in Thoth deck are shown riding chariots (as against the Knights in conventional decks like where they are on horseback. 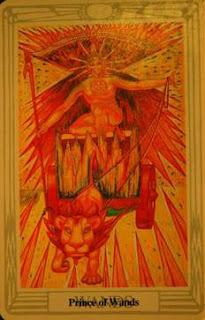 Consequently the chariot appears five times in the Thoth deck. Four Princes riding theirs, and of course the Major card of Chariot itself. The symbology is each of these is striking, keeping with the meaning of the card. The Princes of Disks (Pentacles), Cups, Swords and Wands have their chariots drawn by a bull, eagle, abstract human-like images and a lion respectively. Suffice to say that the Prince of Wands bursts out of the deck blazing.He is a blinding flash personified. The only colours that register at first glance are orange and yellow. The colours of a leaping flame. First and foremost, the card stands for ACTION. Wands represent the element of fire. The element that can transform water into steam, wood into ash and even rocks into lava. So what is the card telling me? To be honest, I have just been plain and simple lazy for the past six months or so. Lazy to the point of being irresponsible. Not just towards others, but towards oneself too. I have thrown all reason and logic to wind and revelled in a foolish and a flawed self-image. An image that refused to look itself in the mirror. Why? Because I just thought I didn't need to. I basked in the arrogance that the mirror would come to me if it needs me. I don't need it, do I? The flaw in the plan was that the mirror was always in front of me. Just that I kept my eyes closed and imagined I was in paradise. The paradise proved to be utopian very soon, and I realized I had laid a trap for myself. The trap is called comfort. In the past three days, I have started a new blog (about my work), got back in touch with long forgotten contacts, and thought of at least three projects that I could initiate. Most of all, I have written, written and written. I have hardly slept for the past 96 hours. I can feel the energy, drive, ambition, speed and dynamism of the Prince of Wands in my veins. What else is the card telling me? That fire can be reckless. If one is not careful, it can destroy instead of just transforming. As I ride forth in the blazing chariot, what am I ignoring? Is there time to smell the roses and feel the grass grow under my feet? OK OK OK. I heard you. But if I wait any longer, I will have fungus growing under my feet. Yes, I will remember all the warnings. But the only way I could have shaken myself out of the decaying stupor was by listening to the rumble of the Prince's chariot. I have been riding the chariot now. The future beckons, as always. Where this chariot will take me is something that time will tell. @ mindspace - Thanks for visiting. I have learnt in bits and pieces through all three methods that you described! One of the best books I for beginners is 'Learning the Tarot' by Joan Bunning. Its available as a free download. Another brilliant one is 'Seventy-eight degrees of wisdom' by Rachel Pollack. Most of all, I learned through maintaining my own journal. Like many others, I started with the Rider-Waite deck, which I still use. I also have Thoth, Mythic, Experimental and Da Vinci. There is an interesting deck that I have by Juliet Shaman-Burke, which actually has TWO decks. One of them is with just line drawings,which you can then paint yourself. I have not touched that so far. Out of curiosity, I picked up a deck called Indian Tarot once. It is ghastly, to say the least. The pictures have given me hours of entertainment. @ Mindspace - Yes, the Shaman-Burke deck is a modified version of Rider-Waite. The drawings are finer, and the colours more pastel. Many people find the Rider deck having too much of yellow and the dull green. Mythic is completely different, entirely based on Greek mythology. Each major and court card is a separate character, while each suit of the minor is one whole story. E.g. Heirophant is Chiron, Magician is Hermes, while the whole suit of pentacles is the story of Daedalus. The experimental deck that I have is by an Osho disciple. I agree with you - it is too 'narrow' in some aspects. Will check the website you have mentioned, thanks!